Ever since the Bitcoin phenomenon started making headlines, cryptocurrency has found its way into the collective human lexicon. However, what's less understood is the blockchain technology which underpins cryptocurrency and its other applications beyond financial transactions - particularly in the world of digital security. However, Visa is now putting the technology to work to create a new kind of digital identity system. One which is built with the modern, globally-connected marketplace in mind. But first, a quick primer on blockchain technology itself to make sure we're all on the same page. Blockchain technology provides a way for two parties to complete a transaction (we use the word "transaction" in blockchain discussions, but you should note that it doesn't necessarily refer exclusively to monetary transfers, but rather any exchange of information) securely and transparently, without the need for a central authorizing authority - such as a bank. 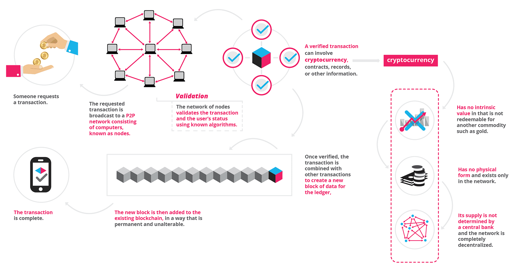 Each stage of the transaction creates a block of data which is stored in a public ledger, and each block has a cryptographic key attached to it which contains information about all the preceding blocks in the chain. Should anyone attempt to manipulate a block, it will cause the key to change so significantly, it would be immediately noticeable to anyone who cares to look. It's this transparency that gives blockchain technology its much-vaunted security. "Blockchain solves the problem of manipulation," said inventor of the Ethereum cryptocurrency, Vitalik Buterin. "When I speak about it in the West, people say they trust Google, Facebook, or their banks. But the rest of the world doesn't trust organizations and corporations that much - I mean Africa, India, the Eastern Europe, or Russia. It's not about the places where people are really rich. Blockchain's opportunities are the highest in the countries that haven't reached that level yet." This is, of course, only a basic primer in blockchain, but should give you enough information to understand how Visa's latest innovation will operate. The new digital identity system is called Visa B2B Connect and is due for official launch in the first quarter of 2019. B2B Connect will tokenize sensitive business data such as bank details and account numbers and assign them a cryptographic key identifier. Tokenizing involves breaking up sequences of data strings into separate pieces such as words, symbols, numbers, etc. Any non-token characters in the data string, such as punctuation, are discarded. The isolated tokens can then easily be used as the input for other processes, such as forming blockchains. At the other end, the tokens can be separated out again to form their composite data once more. The data can then be used to facilitate the transparent yet secure transfer of identity documents across borders. Because blockchain transactions are peer-to-peer, the system removes the need for companies to liaise with central authorities in regulatorily different countries, streamlining the process of doing international business. "As part of the B2B Connect platform, Visa is integrating open source Hyperledger Fabric framework from the Linux Foundation with Visa's core assets," said Visa in a press release. "This will help provide an improved process to facilitate financial transactions on a scalable, permissioned network. The work will enable our mutual financial institutional clients and ecosystem to maximize the network. This is a natural progression that highlights a commitment to ensuring a frictionless cross-border payment experience with the utmost security, trust, and transparency." 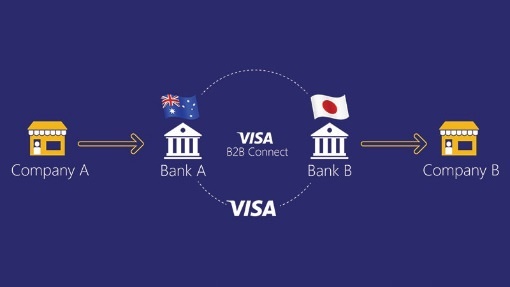 First previewed back in 2017, the Visa B2B Connect platform was piloted by the U.S. Commerce Bank, South Korea's Shinhan Bank, the Union Bank of Philippines, and the United Overseas Bank in Singapore among others. In September 2018, Thailand's Kasikornbank, the biggest by market cap, became the first in the region to complete a cross-border transaction using the technology, proving its viability as an identity platform. Blockchain has lots of potential in the financial industry, and not just when it comes to cryptocurrency. With an industry powerhouse such as Visa bringing the technology into the mainstream, it's likely we'll see many more big brands follow suit in the years to come. "B2B Connect's digital identity greatly reduces the opportunity for fraud that might otherwise exist with checks, ACH and wire transfers today, while also helping companies remain compliant as part of the regulated financial ecosystem," said Head of Global Business Solutions at Visa, Kevin Phalen. Blockchain technology is set to be a hot topic at InfoSec Connect 2019, taking place in March at the Rancho Bernardo Inn, San Diego, CA.